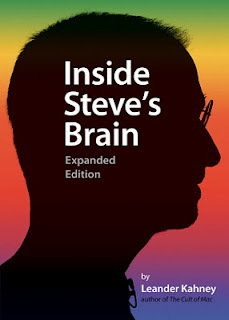 mind the gap: Book: "Inside Steve's [Jobs] Brain"
Book: "Inside Steve's [Jobs] Brain"
This diplomat from the East was deputed to their embassy in Washington DC, in the United States. Having come to live in a Western country for the first time, the little man decided to pick up the holy book and began studying it in hopes of getting acquainted to the new culture more thoroughly. After a while when he met with a professor of religious studies at one of the colleges in New York, the humble man pronounced his predicament that after reading through the book almost three times over, he couldn’t figure out any religion in it. Nothing could be more illuminating in terms of human mindsets. For example, to an Eastern mindset that is used to live a life with abstractions and of elemental powers, such as the dance of the Shinto priests who proudly claim to have no theology; or with millennia old traditions of having religion a part of the daily routine as naturally as sun-drying the woodblocks with Indian sandalwood to gain aroma out of stove; understandably it could be a difficult comprehension in considering a given narration about a certain ruling family of a given tribe of Levantian peoples as a dictum of mainstream and organized religious practice, with due respects that it being the most successful, loved and practiced one in our contemporary world. Apple Inc. (NASDAQ: AAPL, the world's largest IT company by market cap) fan following has attained a sort of a cult status for some time. And perhaps a similar experience could be derived by a business oriented mindset trying to approach "Inside Steve's Brain". It is a book that tells the story of an individual’s work-life, sketchily and at time contradictorily, and irrespective of what the text claims on the cover the book makes it rather difficult to draw business lessons out of it – unless one counts ‘gospels’ among them, akin to God’s word that cannot be challenged. The writer hardly makes any attempts in drawing his own conclusions or opining about certain event, or the controversies, or the specific products, or even the fallouts. Whatever is being said, is said by somebody else, and there are references quoted about them, which seem to come straight out of Google search results. One can’t afford be judgmental about this being either a work of fiction or a factual biography; for anyone hardly knows, let alone understands, “The Holy Ghost” Steve Jobs (cf. pp112). The book takes off fairly well, and evidently Kahney has worked on “Forward” and the first chapters. But the landing is rough – from an iPod design studio to directly into acknowledgements is rather abrupt and bumpy. The writer should have cared to close the loop - summery pages would be an asset here. Towards the last 10% the reader gets a bit tired; suggesting that the writer was tired by the last couple of chapters. But one must consider reading this book. At least for its entertainment value. It should also make a good companion for Pirates of Silicon Valley (try here ). And most apparently, should sugarcoat the bitterness of the aftertaste of other fictions like iCon (try here ). Initially, the title suggested that the book is a collection of leadership lessons, if not psychological analysis, about this enigmatic personality at the helm of Apple Inc. It turned out to be a gross error of judgment: First, there cannot be leadership lessons here, for Steve is not a leader in the classical sense of modern leadership. (In the contemporary sense of classical leadership? A "Great intimidator"? Perhaps yes, like many Generals in the army with their typical command-and-control leadership). And secondly, it is most likely that any attempt of psychoanalysis would end up in a lawsuit. Apple products speak for themselves. Almost anyone who likes to love, hold and showoff a piece of electronics knows that a visit to the nearby Apple Imagine store does the trick. This book might just make that experience more enjoyable. On the other hand, if you are tech novice, looking for a practical yet well-built device and haven’t been to any Apple experience, the book might help you take the plunge and contribute toward your loss of innocence. And one would actually love Steve here before it start getting a little irritating, and then one is left to looking for his or her own reasoning to continue loving. Mostly, one finds one. For that, Kahney deserves credit and appreciation for sure. And then, also for sticking his neck out and going all out in praising the man he adores. Go here to check out the book at Amazon.